As someone who generally works alone, I often look for inspiration in others’ lives. I think that the truly heroic can be found in anyone’s life and I never tire of hearing another’s story. This even extends to the world of movies and the people who bring them to life. I’ve mentioned before that one of the things I love are old movies. The “real” old ones. From the thirties and forties. The era of black and white film, the era that generated some real “legends.” Two I rank at the top are Katherine Hepburn and Bette Davis. For today, I’ll write only about Bette, but I will note that both shared an independence and forthrightness that often got them in trouble, isolated, reviled or ridiculed. Yet, both were often on untrodden paths, trying things women didn’t do at that time, including standing up for what they wanted in their careers. They stuck it out and came back to create legendary careers and blaze a trail for those who came after them. When you think of “leading lady” you think of “glamorous beauties” and Bette Davis, “Bette Davis eyes” aside, certainly wasn’t viewed that way. Even she noted that unlike her contemporaries, “she forged a career without the benefit of beauty.” She said she “became tough by necessity,” and even chose her own tombstone epitaph: “She did it the hard way.” And in reading over her Wikipedia entry, she sure did. Battles over movies, marriages, scripts, and co-stars, she was anything but “demure.” Yet, gifted or flawed, you can’t read her biography and not respect her. She believed in her work, wouldn’t compromise on how she thought something should be done, and stood up for herself in an age where women were not only not taken seriously, but usually victimized. She fought for her rights, as in her lawsuit against Jack Warner to gain more control over her life and work choices, and even though she lost she set an example that others would later follow…and win. If of interest, there is a You Tube video of Thich Nhat Hanh, speaking gently of his responsibility, having been touched directly by war, to bring that reality to others, so they may know. He speaks of the pain of all involved, his own pain and fear, and how to generate peace, love, and understanding. A number of others, including war veterans, speak of their experiences both in Vietnam, and in attending his retreats of healing. What impressed me most was his gentle reply to a veteran whose battle resulted in the death of 5 children. His response to the soldier was one of love, not punishment, his solution not about the past actions, but about “present moment.” He asked the soldier who was haunted by this memory, “Why do you cling to the past?” He told the soldier there are so many children now who need food or medicine. Help them. He offered the man love, freedom from pain, forgiveness, and a way to take actions in the present as a way to release the past. Click here if of interest. Thich Nhat Hanh is a Vietnamese Buddhist monk who teaches mindfulness, awareness, love and compassion and who works with people worldwide, including American soldiers from Vietnam, to heal and find their peace. From track 2 of the CD: “Energy Awareness Meditations,” by Sudhir Jonathan Foust, President, Kripalu Center for Yoga and Health , in Western Massachusetts. Today is Memorial Day. Not the day for cookouts, but remembrance of gifts given to us by the sacrifice of others. In preparing my teaching for tonight’s meditation class, I thought about what gifts we can give back. I thought about three gifts: Acknowledging. Sending the gift of meditative compassion or prayers. Contemplating how war starts and how peace can be grown, so maybe so many young people will never have to make such sacrifices in the first place. In acknowledging, we learn about what those men and women have gone through, witnessed, given up, suffered. Maybe we read about it, or hear it from them as we meet them or volunteer at a USO or VA hospital. We can’t fix their suffering. But we listen and walk with them through their struggles, validate their experiences. It takes courage to hear these stories but maybe that’s key to the power of this gift. Validation of someone’s feelings can be a powerful medicine. Sending compassion or prayers can be even more expansive. I believe those can reach anyone anywhere, and the generosity and good will in them, has no limits. And maybe, just maybe, one of those prayers or thoughts released to the Universe will be directed to someone who’s at the end of their rope: a soldier in a foxhole, a mother at home stressed-out from her husband’s 3rd deployment while she struggles to keep kids and household afloat. Perhaps in that bleak moment, they will feel a moment of comfort and not even know why. Yet maybe it will be the moment of comfort they need to keep going. Maybe if we could catch the struggle before it grew huge, if we could remember who we are at our deepest hearts, we could avoid it becoming such a mess. And then we could celebrate Memorial Day without so many hurt and dead. In our imperfect world, perhaps it will be many lifetimes to achieve such a goal. Still, there are many real gifts that can be given to honor those who sacrifice for us. As I mentioned above, there is always the USO, or VA hospital visits, making quilts, or buying a soldier a meal. Another unusual but incredibly heartfelt gift comes from this group of artists to the families of those who lost someone in this war. These artists have used their talents to create portraits of those lost servicemen. They take pictures and feedback the family provides, then try to capture not only the likeness, but the heart essence of that person, in the portraits. These are done free of charge for the family. To all who have sacrificed for the rest of us, I simply offer a prayer, and a thank you. 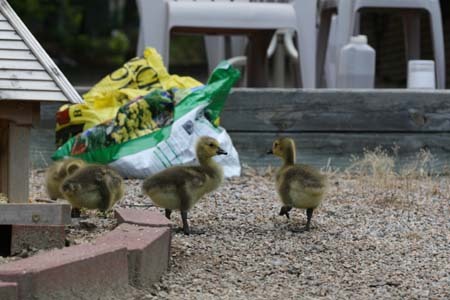 As promised, some pics of the new goslings. These pictures seemed to work fine in Photoshop. I’m thinking the problem pictures of the New England seascape might just be those files. In any event, I’m almost done with that seascape and will be taking final shots afterward. So I’ll give those another try at that point. Maybe the Photoshop demon will be gone. 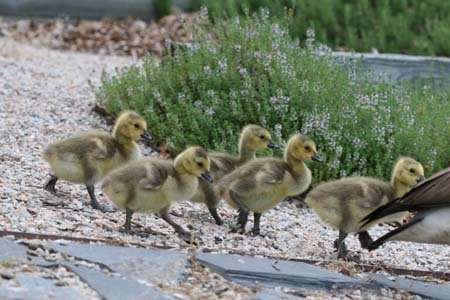 As to goslings, they are a joy. When life seems too stressful or hectic, just watching their simple appreciation of cracked corn in my ground level feeder, is a reminder of what’s really important in life. The 5 of them will sometimes even crawl into the feeder and fall asleep on the pile of corn. Not a bad life! Stomachs full, it’s time to head for the pond. 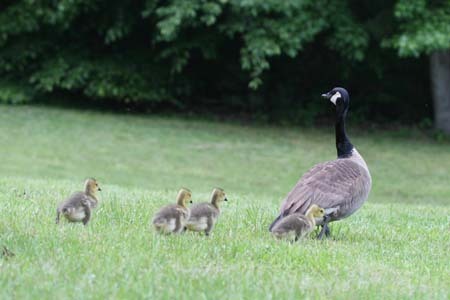 In fact, Mom’s already halfway there and Dad is moving fast, so they need to run. I’m not the only one who’s noticed the babies. The two hawks spend a lot of time circling overhead, something Dad here is very aware of as he shepherds the babies to the water. In my May 8th post I wrote about synchronicity and God sending messages through books. I found out I wasn’t alone in that feeling when someone responded with a comment noting that they too often read things and feel messages are being sent through those written words. On occasion, I’ve felt the same thing from a song lyric, a movie line, a billboard…even a fortune cookie saying. I guess God uses what’s most available, and in the end, it’s not the vehicle of delivery but the message that matters, that sense of quiet nudging, quiet asking. I won’t even comment on that one further. The hair on the back of my neck still stands up …and that one came over a year ago. I shook my head, shoulders dropped, and I sat back down and started writing again. Maybe it’s all imagination. I’m not special. My name isn’t Abraham or Moses or Mary. Last I checked, the angel, Gabriel, wasn’t outside my window. But then an entry from my meditation book reminded me that God speaks in the quiet moments. And he always speaks, to all of us. It’s just that in the busy, noisy times, or in our moments of pride we drown Him out. We just need an open heart…and a little quiet time. I didn’t even realize there was a second pair nesting on the pond. 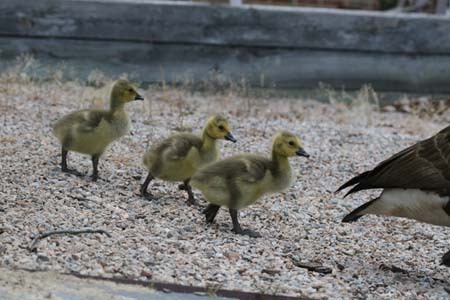 However, obviously they were because today they brought out 4 more goslings. I just love it! 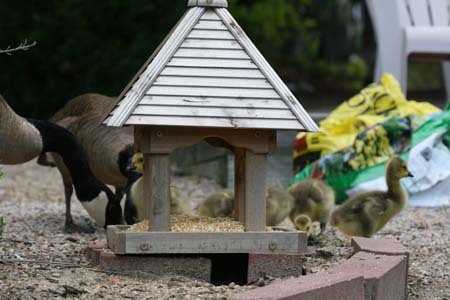 Both families were gathered around my tray feeder in the backyard that I’d filled with cracked corn. Fighting over it yes, but not too hard. For the most part, they sort of nudge each other out of the way. And even the local lone duck that resides at the pond is considered part of their “family” and he’s allowed to join them for dinner. I will get pics soon. Today’s downpour sort of interfered with that. Happy Friday!! You are currently browsing the Soul Mosaic blog archives for May, 2008.